Get Well Gabby | Let’s go home…. but how can we leave? Let’s go home…. but how can we leave? It was a normal day we had no major plans. Maybe we were going to grill some burgers or play some knect on the X-box. To be honest with you, I don’t remember. Gabby was very tired and we promised her we would go to Chuck E Cheese. Myself and all three girls went down to play X-box and Gabby just laid on the couch. Gabby’s behavior had seemed so off, Carolynn called the doctor and came down to say the doctor said we should go to the ER at CHOP. I hate to admit it but I didn’t want to go (something that will haunt me for the rest of my life). The MRI was set for Tuesday. My reasoning was why go today, she’s just tired. We would sit there for hours and end up just being sent home. Carolynn and I actually had a little fight over leaving, however we did end up going. 10 hours later we were told it was a form of Ataxia that would pass in about 3 weeks to a month, no medicine, a little PT and she would be as good as new. It was brought on by her recent case of Strep. It was advised that Gabby be admitted so they could keep an eye on her through the night. Carolynn and Gabby stayed the night, I went home and actually told my in-laws we got lucky, it’s like we hit the lottery. Our daughter was sick but it would pass and everything would be just the way it should be. Gabby was scheduled for an MRI and a lumbar puncture to rule everything out. I got to the hospital early and met Carolynn and Gabby in the room getting ready for the MRI. We cried a little when they sedated her, It was rough to watch. We had lunch and came back to get Gabby, she was still asleep. The plan was to do the lumbar puncture in the recovery room right after the MRI. There was a delay in getting it started and the nurse finally said they decided not to do the lumbar puncture because it probably wasn’t needed. This was the first time I had a weird feeling. Why not do it? I couldn’t come to think they found anything else, if anything the MRI showed they were right and it was nothing. The three of us went back to our room and waited. At about 1:00 two doctors came in and told Carolynn and I to take a seat( they really do that). My legs started to shake. They said they found a large mass in the brain. Carolynn was in hysterics, I was shaking, I tried to mumble on a scale of 1 to 10 rating tumors where was it. All she said again was “ It’s a large mass”. We were told they would be back in about two hours to talk to us. Four hours later, they came back! We had been taking turns hiding in the bathroom crying, crouching by the door crying, walking down the hall crying, you get the point. I can’t tell you what I thought, I can’t tell you what we talked about, all I can say is we cried and Gabby was just Gabby. At about 5:00 they came back and asked us to come to a meeting to look at the MRI slides. Again I can’t remember much except looking at the horrible slides of the inside of my child’s head. How could this be happening? How can these people just sit here and give us this diagnosis? What was wrong with them? How evil was the world? How evil was this place? We listened or at least we were present for this meeting while our five year old was sitting in her room watching TV in bed, oblivious to the things we were just told. We both walked back to the room and just hugged and kissed her, and cried for her. She should be waving sparklers right now not laying in a hospital bed with a diagnosis that neither I or Carolynn have ever said out loud as far as I can remember and to this day we still haven’t said it out loud. Many nights, many tears, many medicines and many procedures. Anger, hate, laughter, love, loss, you name the emotion one of us or both of us have felt it. The 3rd floor, the 7th floor, the 9th floor, the 3rd floor again, and of course the Seashore House. For the first 3 and ½ weeks all we wanted to do was go home. Then we were told we could and that’s when fear came back in. So here it is, we knew we would probably be going home for the last week. The fear is strong, should we, should she get more in patient therapy ( still can’t use left arm, can’t walk unassisted and speech is still hard to understand at times). Maybe we can’t do it? Maybe they can do it better? What we decided was PT, OT and Speech Therapy outpatient. We will be coming to CHOP every morning for radiation and Clinic once a week. We will administer the Chemo from home. Sounds like a plan right? We have had three daughters, When our first daughter was born, we were so afraid we would break her, we were young how could we take care of a baby, We couldn’t even keep plants alive let alone a baby. We read every book available still had no idea how to do anything. Our plan was to bring the baby home and relax, no visitors, and get used to a new way of life. Guess what, that plan went down in flames. A few hours home, Carolynn was in bed crying, Madison was howling and I was on the phone whispering to my mother-in-law “can you please stop by and don’t tell Carolynn I called you”. The house was so loud but yet so quiet. I can’t explain it, hopefully some of you will understand. So here we are again, going home tomorrow with our baby. Instead of tracking how much she is pooping, we need to track white blood cell counts and platelets (pooping too because of the meds). Instead of baby proofing the cabinets we need to figure out where to store the Chemo. Instead of showing off our baby to the world, we need to watch each of you and your children to make sure no runny noses or colds get in the door. 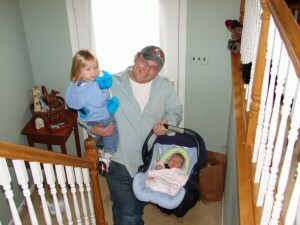 As bad as we want out of the Hospital, as bad as Gabby needs her sisters, there is a sense of safety here. If she starts to throw up, the CT scan is right down stairs. If she howls in pain the nurse is a push of a button away. If she get’s a fever, is dehydrated, has pain in her neck, etc there is a doctor right around the corner. I realize this sounds insane to most of you, but it’s a fact, Gabby’s world has changed forever, our world has changed forever. I don’t just worry about having her look both ways before she crosses the road, now I’m worried about what happens if her cell count drops to low or she get’s a fever? The saying has been the world is always changing. I don’t think that applies to Gabby and our family anymore. The world does keeps going but Our life’s have stopped and have changed. So while you all gather in a large crowd to watch the fireworks, we are going to be afraid when someone knocks at the door. Our new normal would just seem abnormal to most people out there. A few things that made Gabby laugh and happy today. When she gave her sisters the butterfly’s she made. She stated she made them “ for someone special” then smiled and handed them to her sisters. It was the cutest thing I have seen in a while. Laughed again in the pool as she sprayed her sisters and listened to Justin Bieber. One of the nurses gave her an Aurora baby princess doll, she loved it. We are going home she wants to stop at Build a Bear, Chuck e Cheese and pet her dog tomorrow. Let’s start with the dog. So a new chapter starts, I will never forget Memorial Day 2011 or the day after were we were given the worst news any parent could hear. But I also won’t forget July 2nd 2011 , That’s the day we left the hospital. We will remember this day as the beginning of our new “normal life” The beginning of Gabby’s new life, The beginning of life as we now HAVE to know it. I am in awe that you take the time to update all of us that care about Gabby and your family……..also that she will be coming home to a familiar place where she will be more comfortable during her struggle to get better. I continually look for updates about your beautiful Gabby even though I have two beautiful grand daaughers that I try my best to help with. Many of your thoughts and observations help me to be a better grand mother to both of them………as well as helping Gabby in anyway that I can. I’ve baked for her, I wear her bracelet every day (I will be giving it to my grand daughter once I know she won’t eat it!) and on Friday and Saturday I am holding a yard sale in her honor (I hope we get lots of customers!). Tonight, my friends and I went to the First Friday in Phoenixville and had some yummy treats made just for Gabby……….I have to say I got a bit upset at one point when a mother said her children couldn’t have white flour but I pointed out to her that they had beautiful bracelets and ribbons as well as a donation jar; then I got pretty teary-eyed when she allowed her children to donate a little something in the big jar………..Anything is possible if we BELIEVE! I don’t know your family but have been following the updates, praying like crazy, and supporting you in any way that I can. What you wrote in your update does not sound insane at all. It is simply the difficult truth that you now face. I will continue to keep you all in my prayers as you take this next step. Every time I hear the song below, I think of your family. Maybe it can bring you some strength and comfort as it has done for me. What a great day. May God give each one of you exactly what you need to get Gabby and the rest of your family back into the “home groove” since you all have been in the “hospital groove” for so long. Please keep the updates coming, since it gives us specific things to pray for. May God bless all of you and keep you in the palm of His hand. I have been following Gabby’s story since you first went online. I find myself checking your blog every day for the latest updates. Through your messages, I have fallen in love with your little girl. Your writing is so very honest, raw, and inspirational. Until last week, your story was just that…a real-life story of a real family encountering what I’m sure has been the most terrifying time of all of your lives. Then last Tuesday, it all came home. My Dad had been experiencing some cognitive difficulties, and his primary care physician sent him for a routine MRI thinking that maybe he had experienced a minor stroke. On the day he was to meet with his physician, so confident we were in the results, that he went by himself to the doctor’s office. As you well know, the shock that accompanied the news that he had a 21mm “lesion” in his parietal lobe was beyond comprehension. He had the presence of mind to know he was too overwhelmed to assimilate what he was being told, so he asked if he could come back the next day with my mom, and my sister, who is a nurse. The doctor agreed. They admitted him to the hospital that very day. The idea was to conduct multiple tests, since tumors in older adults are statistically more likely to be metastases from a primary source elsewhere in the body. So far, the scans appear clean, but we won’t know for sure until we speak to the oncologists next week. They are tentatively planning surgery for next week, and it appears that the mass is fortunately, operable. Although none of the doctors have even suggested that it could be benign, I am still hoping. It’s interesting. We have no problem using the “C” word when it pertains to other people, but when it hits home (even with the doctors), the words used are “lesion”, “mass”…all euphemisms for what it really is. A vicious malevolent killer that targets who seem to be the most vulnerable with blatant disregard for the lives that are irrevocably changed forever as a result. I’ll admit it. I’m angry. Furious, actually. The problem is that I don’t really know who (or what) I am angry at. Maybe it’s just the apparent randomness of it all. We have a lot in common, your family and mine. I am the oldest of three sisters, and while we are now adults, it seems like yesterday that we were doing all of the simple, fun, seemingly insignificant things that families do every day…and interacting with each other in much the same way as your girls do. We were lucky to grow into healthy adults, marry, and go on to start our own lives. My middle sister has two beautiful sons, and my baby sister (although she is no longer a baby) is expecting her first child in September. I can’t even fathom the possibility that my dad would not be able to be there for his youngest grandchild as he was for all of us. But I believe. I believe in the strength of your family (and mine) to see our loved ones through whatever might lie ahead. And I believe that both Gabster and my Dad are going to beat this. So I’ll make a deal with you. 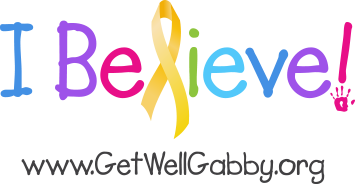 When Gabby and Dad are well again, I will join forces with you and anyone else whose lives have been turned upside down by this life-threatening illness. We will pursue it with the same vigor and perseverance that all survivors are gifted with, and we will figure out a way to make sure that someday, other families won’t have to experience what we have. Until then, please know that Gabby and your family are constantly in my thoughts. I’m sending healing energy in her direction. And someday, I hope to have the chance to meet the heroic little girl who has in the space of a few weeks become my personal inspiration. I pray for your daughter and your family every day! You have made me realize what is important in life! I hope you all can find some happiness in being home and like Gabby I love my animals. I sure being around her pup has brought her such love. I believe and i’m so grateful to hear you do too! God Bless you all! !